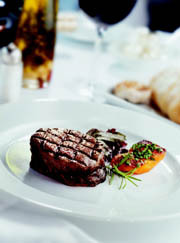 Grand Hyatt Seoul's Paris Grill features authentic European dining, Australian Wagyu beef. Known as "the Caviar of Beef" the beef dish is recognized by gourmets and international culinary experts as the most tender, succulent and tastiest meat in the world presently. Designated as a living national treasure of Japan and prized by the Imperial Court, the Australian-bred Wagyu cattle are pampered with an exacting regime of top-notch food, regular massages, and a diet of unlimited beer. This produces meat textured with a high degree of marbling of unsaturated fat, low in cholesterol. The Paris Grill's Wagyu beef is charcoal-grilled in the oak wood fired oven, which imparts an aromatic flavor to the beef. Enhanced by the magic touch of Julien De Vita, head chef of the Paris Grill, diners will experience the smooth, velvety, incomparably sweet flavor, unsurpassed in taste and texture. This exquisite beef is available in a number of main dish selections including Sirloin, Rib Eye, Tenderloin, or Tenderloin with lobster, priced between W33,000 to W53,000, exclusive of Tax & Service Charge for dinner. For more information or reservations, please call 799-8161. Famous for their European-style comfort, sophistication and contemporary continental cuisine, The Paris Grill and The Paris Bar, with their stylish design, have an ambience conducive to sharing both lively conversation and fine food with family, friends and business colleagues. The restaurant is particularly appropriate for business meetings as private rooms are available for extra privacy. Designed in the style of a 1930's Paris brasserie, The Paris Grill is decorated in dark wood and marble and the open kitchen features a wood-burning oven, rotisserie and grill. The lunch and dinner menus feature classical European cooking with a modern twist. The emphasis is on exceptional quality, fresh ingredients and an uncomplicated style of cooking that enhances the food's natural flavours. The Paris Bar commands a spectacular view of Seoul and is the ideal place for an evening of fun and relaxation. Cocktails and pre-dinner aperitifs are offered alongside a wide selection of wines, beers and spirits. The handsome decor, soft lighting and friendly service, combined with entertainment from the bar's resident pianist, contribute to the relaxing atmosphere. 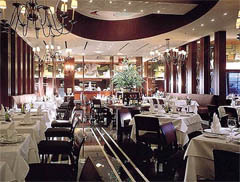 The Paris Grill and The Paris Bar are located on lower level 1 of Grand Hyatt Seoul.